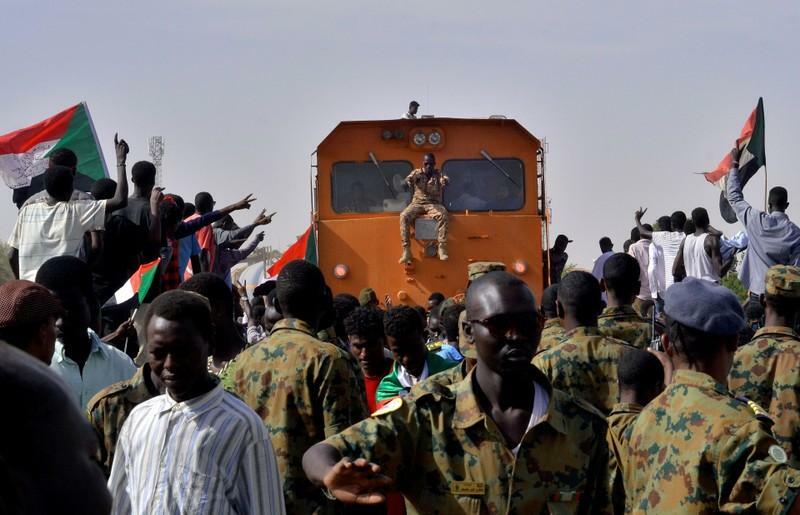 Sudanese protesters stop a train. Sudan’s main protest group demanded immediate handover of power to a civilian transitional government, saying it would keep up street demonstrations which ousted former President Omar al-Bashir to achieve its aims. The Sudanese Professionals’ Association (SPA) called for the establishment of a transitional council protected by the armed forces, adding it would exert “all forms of peaceful pressure to achieve the objectives of the revolution”. The military council that replaced Bashir, ousted on Thursday by the military after three decades in power, announced new decisions on Sunday including retirement of Defence Minister Awad Ibn Auf. He and his deputy resigned as head of the transition council after assuming the positions following Bashir’s exit. The council appointed Lieutenant General Abu Bakr Mustafa as intelligence chief, succeeding Salah Abdallah Mohamed Saleh, known as Salah Gosh, who resigned on Friday. The transitional council spokesman told a news conference in Khartoum the military was ready to work with opposition groups to establish a civilian government. “If they are ready to approve anything, we are ready to implement it,” he added. Lieutenant General Omar Zain al-Abideen, also a council member, said the opposition would have a week to submit suggestions. The head of the military council, Lieutenant General Abdel Fattah al-Burhan, earlier said the council invited the opposition parties and protest organisers for a meeting. The SPA and other main opposition parties, which make up a group known as the Forces for Freedom and Change, said they did not attend the meeting. A Reuters witness said the meeting was attended by largely unknown politicians and parliamentarians known to be loyal to Bashir’s party. Kabbashi said there were orders by the former regime to disperse the sit-in “at whatever cost,” but the military refused and will continue to protect protesters. Several thousand protesters continued the sit-in outside the Defence Ministry and for the first time state television showed footage of people marching and chanting in the streets, while a presenter congratulated their “revolution”. SPA, which demanded civilians be included on the transitional military council and for Bashir’s close associates to leave, called for the arrest of prominent National Intelligence and Security Service generals, including its former head Salah Gosh and the removal of the prosecutor general. It also called for the arrest of Bashir, who the army has already detained. Kabbashi said a committee would take over the former ruling party’s assets and Sudan’s ambassadors to Washington, a former intelligence chief, and to Geneva, a former foreign minister, were sacked. He added the military council would release all army and police officers who participated in demonstrations. Up to four thousand people were still camped out on Sunday, a Reuters witness said, fewer than in previous days, with some people returning to work. “We are at our sit-in until we hear from the army. We will defend the revolution from hijacking,” Mouawiya Mubarak, a 21-year-old student, said.